What harm do a few dandelions do? I had previously been aware of Giant Hogweed‘s dangers, and noted when it was reported in Wisconsin recently. 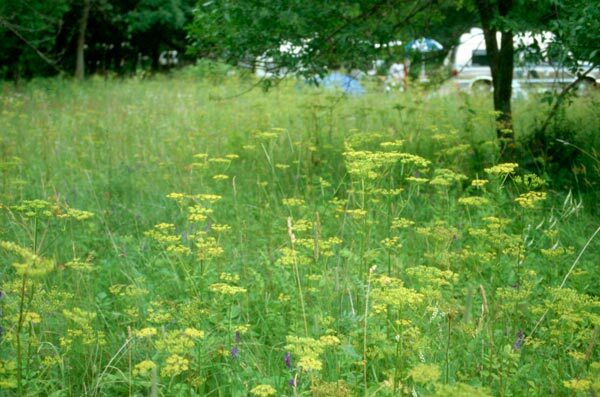 Certainly glad there was none of it around here, and then I found wild parsnip! Same theme; different plant. This strikes a little closer to home- literally. I found a few plants in our yard, thankfully in an easy to access area from all sides. I don’t recall hearing anything about the plant up until now, and I don’t remember seeing it growing anywhere from when I was a kid. Other than the small patch of plants, it’s not close to our area that I’ve seen, but we don’t have to go far to see whole ditches and edges of fields full of it. The DNR and local media have shared more information now that the plant is in bloom with the summer season. I’ve taken precautions to eliminate this noxious greenery– unfortunately, I didn’t catch it sooner. I’ve taken steps to kill the weeds at the roots, and dressed appropriately to remove and burn all the seedheads. Thankfully, it all was still fairly green, so I think we got to it in time before seed dispersal. I’m not sure how it traveled to our yard since there’s not much else close around. Perhaps via creature travel… Watch out in your own outdoors and adventure safely to save yourself some trouble! There’s nothing quite like grilling out, and one recipe that has turned asparagus-haters into asparagus-lovers in my family is grilled balsamic asparagus. There are quite a few tasty yet simple variations available online. Mine is as follows; amounts are determined by the amount of the veggie you are making. The coriander provides a citrus-y zing that goes well with the balsamic. This recipe is easy to make in a skillet/wok, though flame grilling provides a better flavor, IMHO. To prepare the spears, it’s not required to trim them with a knife or peel them. You can snap the spear in two towards the bottom (the more fibrous part will separate from the more tender part naturally). Rinse and prepare asparagus (as noted above). Put all ingredients into a sealable plastic bag and set in a baking pan (in case the bag leaks). Refrigerate and marinate for at least 1 hour, mixing at least once or twice, so all spears sit in the mixture/are coated well. Grill until the spears are cooked to desired doneness, rotating as needed. (I prefer to cook them until darker green, but not so much that they are mushy.) Serve hot.